Our Graduation stoles are the perfect way to represent yourself. We have a kelly green stole with black trim that looks spectacular. Once your ceremony is over, your graduation stole makes for an excellent reminder of all your hard work that you can easily hang on display. Your graduation is just around the corner, allow the pros over at Honors Graduation to help you get your graduation attire together. We know that it takes an enormous amount of hard work to make your dreams become reality, and thanks to your relentless dedication over the years, you have finally made it. Your graduation day is one that you'll never forget. Your closest friends and your family will all be there to join you in celebration and cheer you on as you accept your degree or diploma. Traditionally students dress in a graduation cap and gown at the time of their ceremony. Many schools have this as a minimum requirement in order to walk. Students also like to accessorize their wardrobe to symbolize the group they are apart of or a special achievement that they have earned. At Honors Graduation we have all the accessories you're looking for along with convenient package deals including the essentials like your cap and gown. Here at Honors Graduation we have various options available for our graduation stoles. 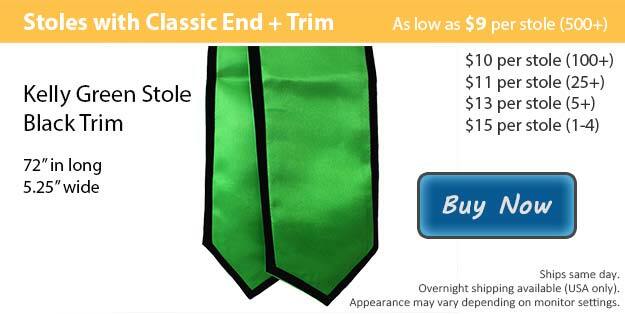 Choose between our angled finish or the classic cut for your stole style. Both choices come in lengths of either 60 or 72 inches. Our stoles can be purchase with or without a contrasting trim. We have eighteen colors that you can select from for the main stole color as well as the trim. Each of our stoles can also be customized as well. Our customization team uses embroidery to add the image or wording of your choice right onto your stole. Not what you're looking for? Check out our Complete List of Graduation Stole Colors.